Joseph ... went up from Galilee into Judaea, from the town of Nazareth to the town of David which is called Bethlehem — for he was of this house ... to enregister himself together with Mary, his betrothed, who was with child. And it came to pass that while they were there she completed the days of her delivery and brought forth her first-born son; and she swathed him round and laid him in a manger, because there was no place for them in the inn. The symbolism of the tree continues — the tree being a mediator between heaven and earth. 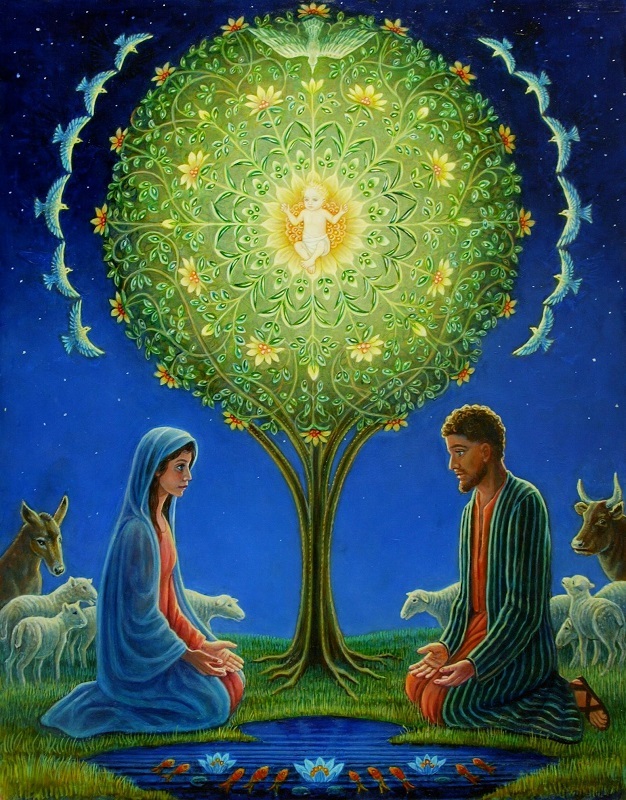 In this painting the tree forms a circle which represents the universe, with the Christ child at the center. All the elements, all the animals, birds and fish bow before him and Mary and Joseph kneel in awe.